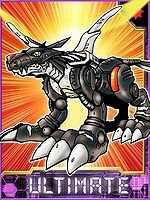 A Virus attribute Metal Garurumon whose entire body is armed with cold-based weapons. It has a fearsome personality, in that once the Laser Sights on its snout lock onto its prey, it will pursue them relentlessly and bombard them with missiles regardless of whether they are friend or foe. Its Special Move is a blast of cold air that freezes everything in an instant (Cocytus Breath). 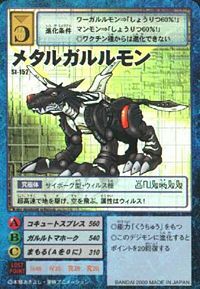 A Metal Garurumon which evolved to become Virus attributed. It is armed with cold-air type weapons in its body and laser sights to help it to detect its prey. A fearsome Digimon, it fires missiles at anybody, regardless of friend of foe. 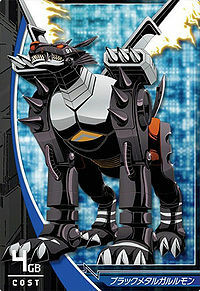 A Metal Garurumon Virus with black metal body. It has ferocity to attack the enemy with missiles that persecute they relentlessly until reaching them. 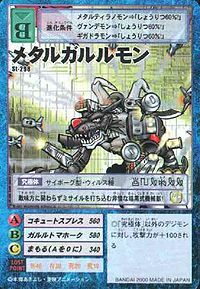 Cocytus Breath  コキュートスブレス Kokyūtosu Buresu Freezing Breath/Metal Wolf Claw Breathes out a blast of air that freezes the opponent solid. Launches a large missile out of its belly. 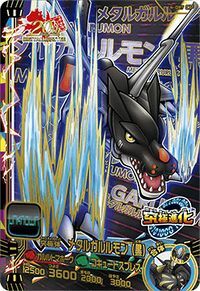 A stronger version of Garurumon (Black)'s attack Freeze Fang. Unleashes a barrage of missiles. Shoots a homing missile that can freeze its target. 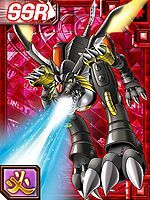 Metal Wolf Claw  メタルウルフクロー Metaru Urufu Kurō Metal Masher Charges forward through the air, trailing ice from its wings. Charges up and fires a heavy, extremely powerful missile from its chest plate. 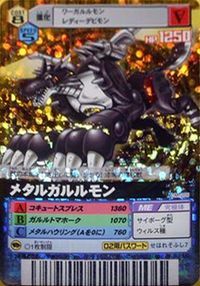 Grace Cross Freezer  グレイスクロスフリーザー Gureisu Kurosu Furīzā Ice Wolf Claw Unleashes a massive attack of missiles that freeze the opponent. Fire Wolf Claw  ファイアウルフクロー Faia Urufu Kurō Metal Grinder Blasts sparks from its mouth. 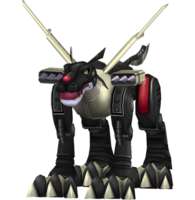 Metal Garurumon appears in Igloo City after Apocalymon has been defeated at Infinity Tower. Metal Garurumon is unlocked in the Surprise Attack in the Single Player mode. 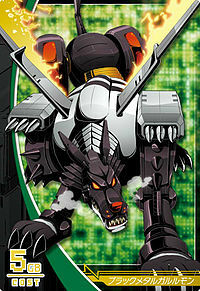 He evolves from Gabumon (Black) and Garurumon (Black). Can be evolved from Were Garurumon (Black) via Piyomon. 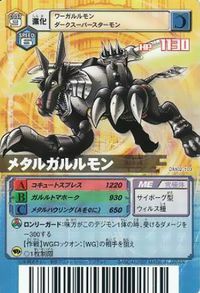 Can be evolved from Were Garurumon (Black). 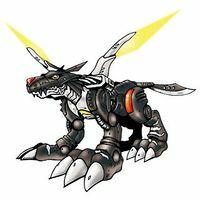 Metal Garurumon is an unobtainable boss Digimon. It sprints across the land at high speed and flies through the air. Its attribute is virus! A heartless dark machine beast, it sends a barrage of missiles at both friend and enemy! 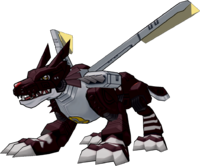 A Virus attribute Metal Garurumon, the armaments covering its entire body have been made to be cold-based. It has a merciless personality, chasing down and attacking at full power any prey it has decided upon. 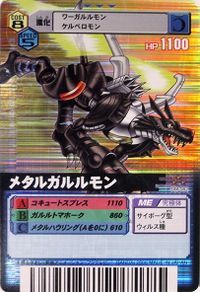 A Metal Garurumon of darkness equipped with a cooling weapon within its body. It fires missiles that chase any prey captured by its laser sight, regardless of enemy or ally. A Virus attribute Metal Garurumon whose entire body has mutated to become black. It is also known as the Dark-type Mechanical Beast. 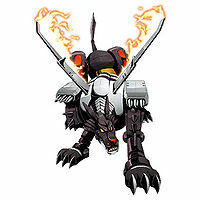 Metal Garurumon (Black) appears as an enemy Digimon in the Arcade component of the game through a special 20th Anniversary event. This page was last modified on 31 March 2019, at 14:39.